VietNamNet Bridge – Deputy Prime Minister Trinh Dinh Dung on Monday spoke with provincial authorities and government agencies about the need for urgent action to prevent landslides in the Cuu Long (Mekong) Delta. Speaking at the meeting in An Giang Province, the deputy PM praised the efforts of localities in preventing and controlling natural disasters. In recent years, climate change in the area has caused droughts, saline intrusion and extensive erosion. He said that provincial leaders should draw up sustainable development policies and new growth models to cope with climate change. The deputy PM also urged authorities to quickly relocate households living near dangerous landslides to safe places. He said the Ministry of Agriculture and Rural Development and Ministry of Natural Resources and Environment should work with agencies to annually survey river flows, river beds and alluvium volume on the Tien and Hau rivers. The Ministry of Natural Resources and Environment, he added, should thoroughly inspect sand mining activities and issue licences for sand mining. In addition, the Ministry of Construction, Ministry of Planning and Investment as well as the Ministry of Finance should provide funds for localities to implement necessary measures to prevent erosion, he said. Tran Quang Hoai, deputy head of the Ministry of Agriculture and Rural Development’s Irrigation Department, said the delta had over 500 landslide spots, mostly along riverbanks and coastal areas. The hardest-hit areas are in the provinces of An Giang, Dong Thap, Bac Lieu and Ca Mau. The landslides have occurred because of illegal sand mining, deforestation, rising sea levels, groundwater exploitation, changing river channels, imbalance of mud and sand, and even geologic surveys. Hoai said the localities should use advanced technology to manage sand mining activities and strictly fine violators. He asked the Ministry of Natural Resources and Environment to monitor sand mining activities and report to the Prime Minister. In April, in An Giang Province, 14 houses fell into the river after a landslide, leaving 107 households and one factory in urgent need of relocation. Vuong Binh Thanh, chairman of An Giang’s People’s Committee, asked the government for VND116 billion (US$5million) to repair landslide-affected areas and build a resettlement area. 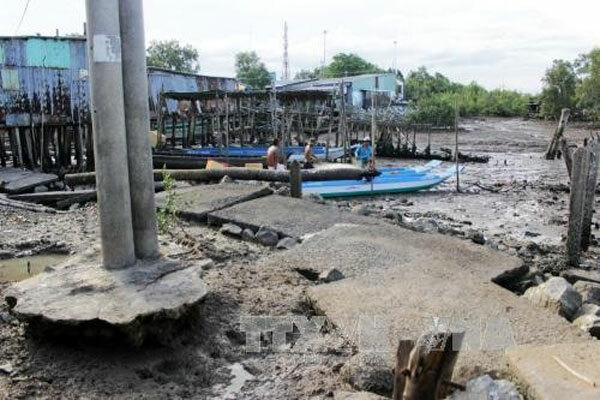 The same situation has occurred in Dong Thap Province, where eroded areas of a total 5,924sq.m have affected more than 200 households living along riverbanks. Nguyen Thanh Hung, deputy chairman of Dong Thap’s People’s Committee, said the province had asked the government for VND245billion ($10.8million) to build construction works to prevent landslides. Bac Lieu, Soc Trang and Can Tho authorities said that delta provinces had been losing hundreds of hectares of land along riverbanks and the coast each year, but that forecasting and evaluation of the impact of natural disasters was still limited. Serious landslides have eroded 150km of coastline in Ca Mau Province, which has been affected by climate change and rising sea levels. The landslides have threatened thousands of people living in coastal areas, according to the province’s Department of Agriculture and Rural Development. To Quoc Nam, deputy director of the department said that landslides along the province’s eastern and western coasts were caused by rising tides and a northeast monsoon. Along the province’s western coast, erosion has been worsening, with a total length of 114km, increasing a risk of breaches. The eastern coast has about 48km of seriously eroded areas and 24.5km at high risk of landslides. In addition, the province has lost about 10km of forest cover, affecting aquaculture farms and infrastructure along the coast. Previously, the province upgraded over 23.6km of high-risk landslide areas at a total cost of more than VND650 billion ($28.8million). However, the work failed to prevent serious landslides. The province has asked the central government for about VND200 billion ($8.8million) to build 10 kilometres of sea dykes along its forested eastern coast. It is also seeking about VND1.4 trillion ($62million) to relocate nearly 4,800 households living in high-risk areas along rivers and the coast. According to the department, the southernmost province of Ca Mau has been losing about 450ha on average of coastal land each year, including 20-25 metres of land along the western coast and about 45-50 metres of land along the eastern coast. Landslides have the potential to affect 100,000 hectares of aquaculture farms and more than 260,000 households in the delta.